Chitwan Medical College Teaching Hospital, in Bharatpur, Nepal is affiliated to Tribhuvan University and is a first ISO certified Medical College. This private medical college in Bharatpur is a 750-bed teaching hospital. All kinds of facilities are available for the treatment of patients. Several fields of bachelor studies such as in medicine, dentistry, public health are taught here. 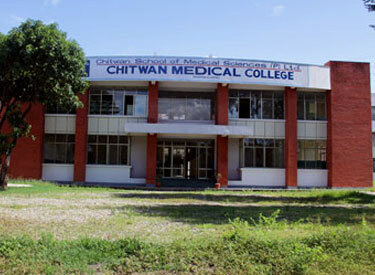 Initiated and managed by renowned medical professionals and practitioners of the country making this Institution peculiarly only one of such kind, Chitwan Medical College (CMC) is providing a world-class medical education to future academics, medical practitioners and health-care professionals at affordable prices. CMC, as an academic and medical centre managed by highly-qualified and reputed experts and professionals, is offering various academic courses like Master of Nursing (MN), Master in Public Health (MPH), MSc Clinical Microbiology, Bachelor of Medicine and Bachelor of Surgery (MBBS), Bachelor of Dental Surgery (BDS), Bachelor of Science in Nursing (BSc Nursing), Bachelor of Science in Medical Laboratory Technology (BSc MLT), Bachelor of Pharmacy (B Pharm), Bachelor of Science in Medical Imaging Technology (BSc MIT), Bachelor in Public Health (BPH) and Bachelor of Nursing (BN).